Too hot on an August day for the wide-open trails through the dunes. Too crowded for the Cottonwood Trail. 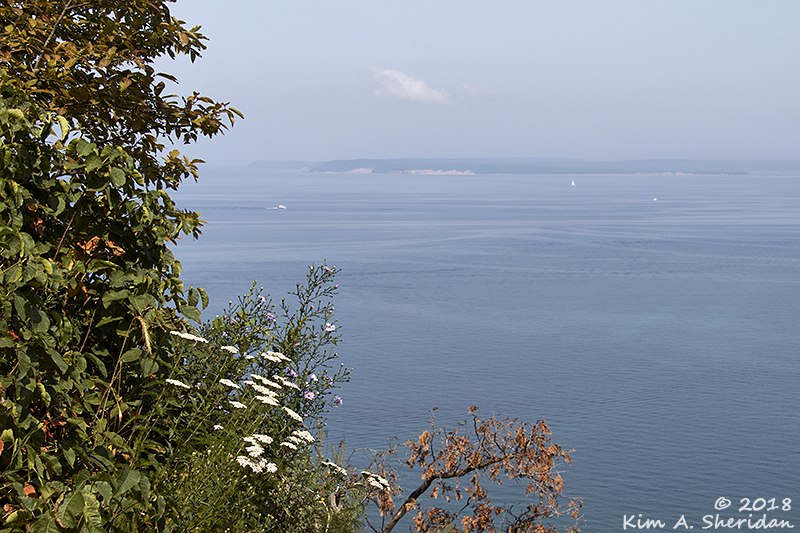 The Empire Bluffs Trail? My favorite, but I’ve done it before. Maybe something new? 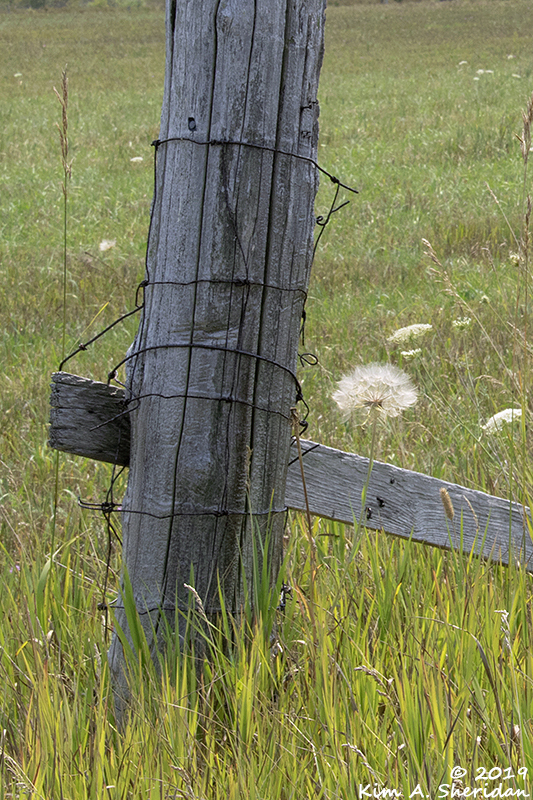 Maybe something with a meadow, and cool woods that open onto Lake Michigan. A triple-scoop Sleeping Bear Sundae, as it were. Maybe the Pyramid Point Trail? Yes, the Pyramid Point Trail. That would do quite nicely. 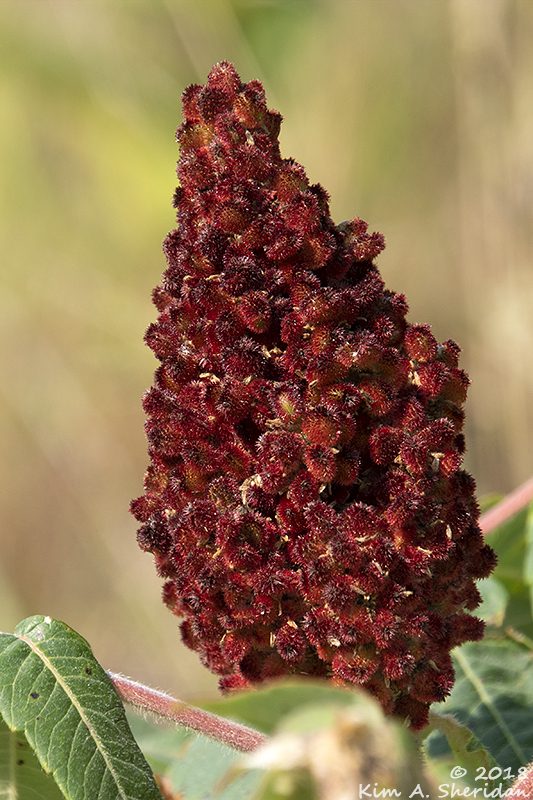 The deep red prickles of this Staghorn Sumac seed head caught my eye. 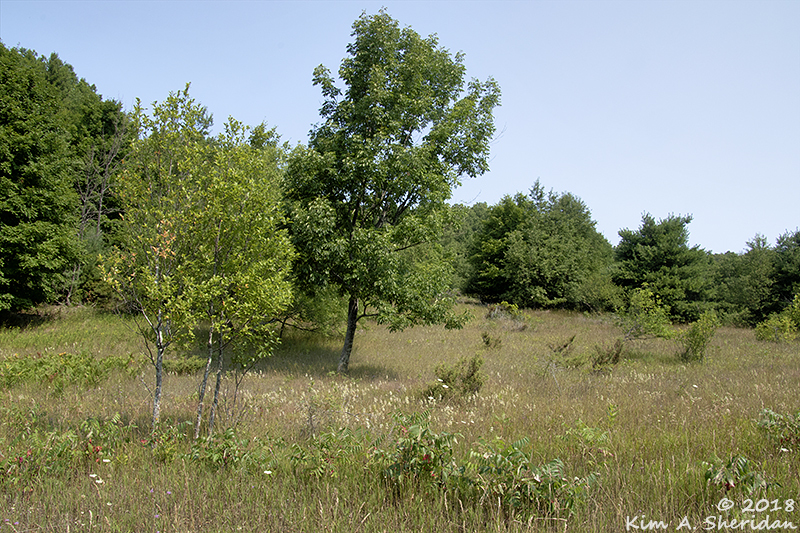 Sumacs are small trees, but in this meadow, many are not much bigger than shrubs. They thrive in the sandy soil where other plants might not. 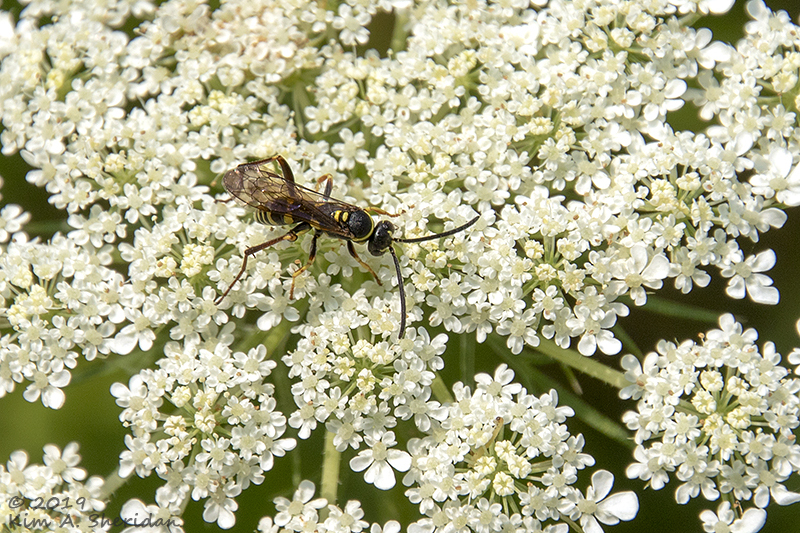 Queen Anne’s Lace was in bloom, and its flowers attracted a variety of insects. The plant can cause skin irritation, but it’s nowhere near as toxic as its lookalike cousin Poison Hemlock, which can be deadly. A different bug sampled the delights of a different bloom. See that dark amethyst flower? Many Queen Anne’s Lace flower heads have a purple flower near the center of the umbel. Many, but not all. Wait, what’s an “umbel?” That’s the botanical name for a flower head shaped something like an umbrella, with short flower stalks spreading from a central point. Here the flowers have gone to seed and the umbel has curled in on itself. 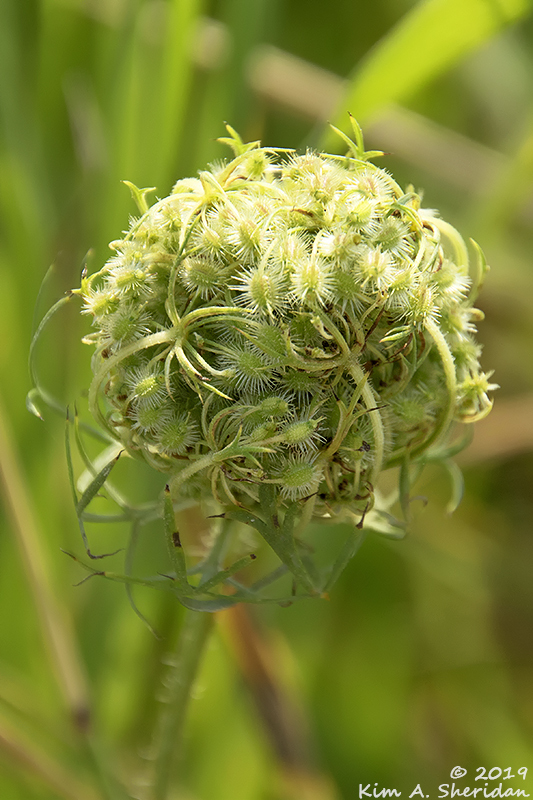 Queen Anne’s Lace is also known as Wild Carrot. Or Bird’s Nest. A scoop of Mint Chip for our Sleeping Bear Sundae? 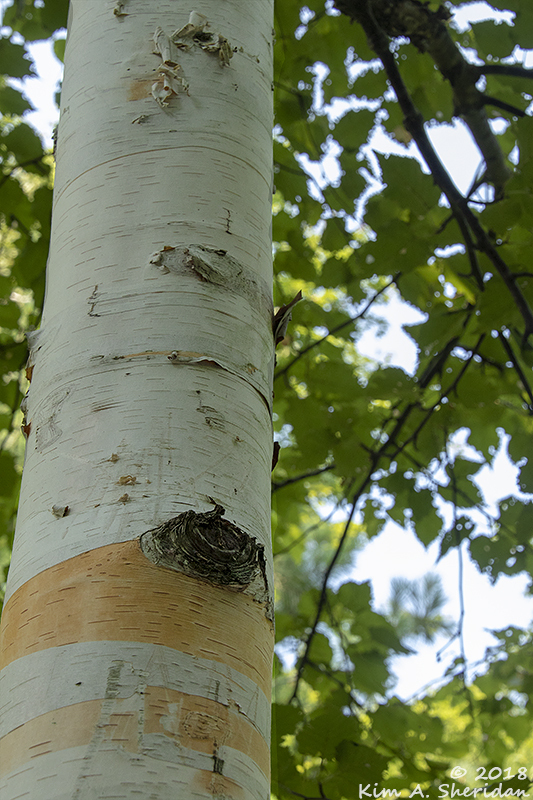 Yes, please: the deep green shade of the forest welcomed explorers with a lovely birch tree, portions of its clean white bark curling away. The path began to climb steeply through the dark beech and maple woods. I huffed and puffed my way toward the top, overtaken by little kids and teenage girls in flipflops. Sleeping Bear Dunes draws crowds on August weekends, and everybody walks uphill faster than I do. I’ll bet they walked too fast to see the wonderful things I did, though. 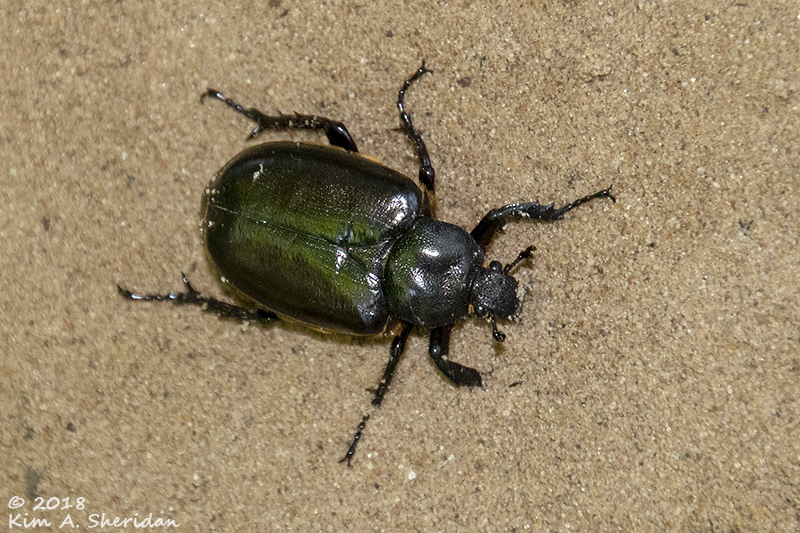 Like this dark metallic green beetle ambling along the sandy path. He wasn’t in a hurry, either. 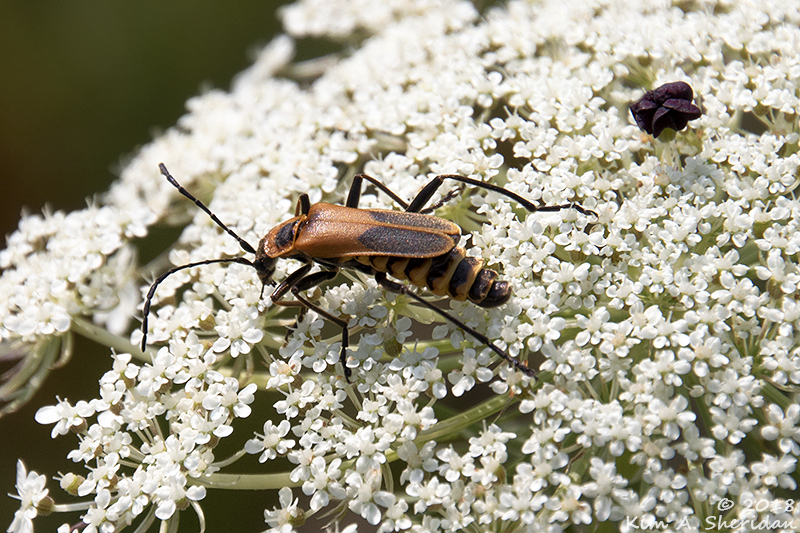 Reader Participation: Name your favorite field guide to insects in the comments. Extra credit if you know who this green critter is. Bonus points if you can tell me who the insects in the meadow are! Finish the sundae with a scoop of the mysterious Blue Moon ice cream: the trail peaks at the dune’s top, and peeks at Lake Michigan. Visible in the distance are the Manitou Islands. I continue to be amazed at the dazzling colors of Lake Michigan on a sunny day. I’d hoped to find a quiet shady spot to eat my lunch while I thought of more names for the color of the water. Alas, quiet and shade were lacking at Pyramid Point on this particular day. Most people walk up the hill to Lake Michigan and then back the same way, ignoring the other side of the loop trail. I decided to try the road less traveled, deeper into the woods, down through a valley. Here I had the trail to myself. I soon found a large fallen beech tree that made a perfect bench for me and my lunch. From there the trail continued up the other side of the valley and along a road back to the trailhead. That didn’t appeal to me, so I retraced my steps back to the meadow and my car. For the final flourish, a dollop of whipped cream: a drive through the Port Oneida Rural Historic District. It’s a step back in time and the perfect topping to the day. 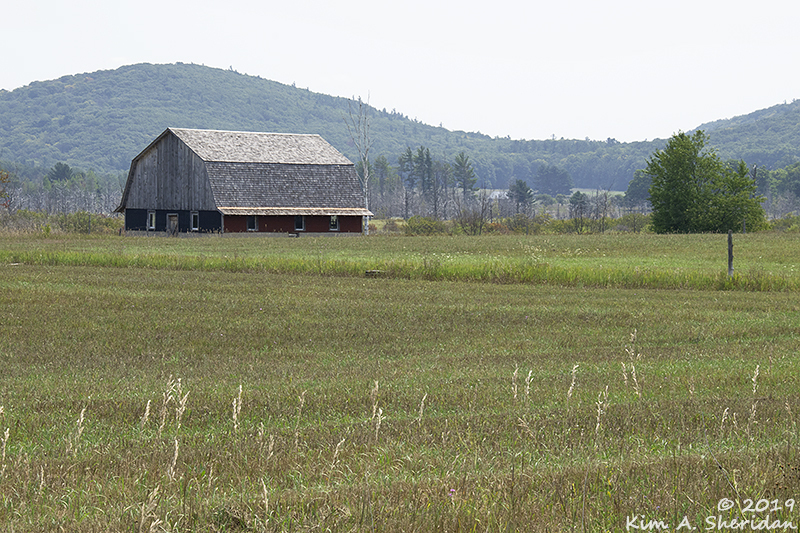 The district is sprinkled with old farms typical of the late 19th century, free of modern technology and preserved and protected within Sleeping Bear Dunes National Lakeshore. And I do love old barns. I’m easily distracted, and distractions abounded here. I saw something curious in a field and circled around to take a closer look. Four of them, to be specific – two adults and two juveniles. The adults wore a red eye mask. Cranes mate for life, two decades or more, and pairs stay together year-round. In courtship, they are dancin’ fools, spreading their wings, bowing and leaping into the air. This was long past the courtship phase, however; no date-night dancing for them. The kids were home and in need of a watchful eye. Juveniles stay with their parents for 9 or 10 months. 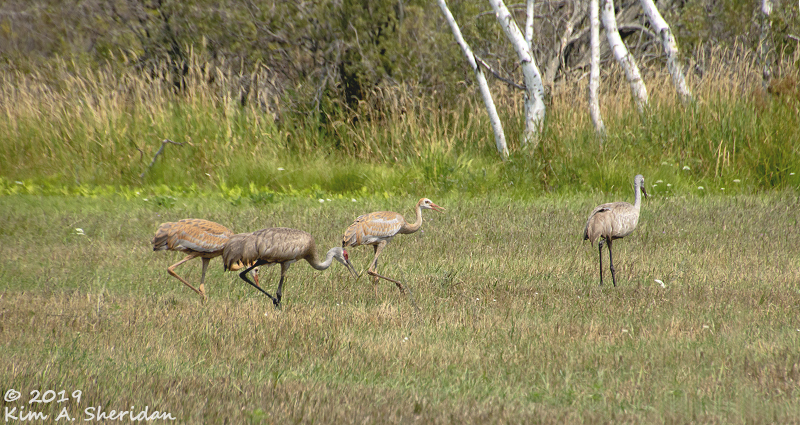 Adult Sandhill Crane in front, juvenile to the rear, both busily feeding. Meadows like this offer a good variety of insects. 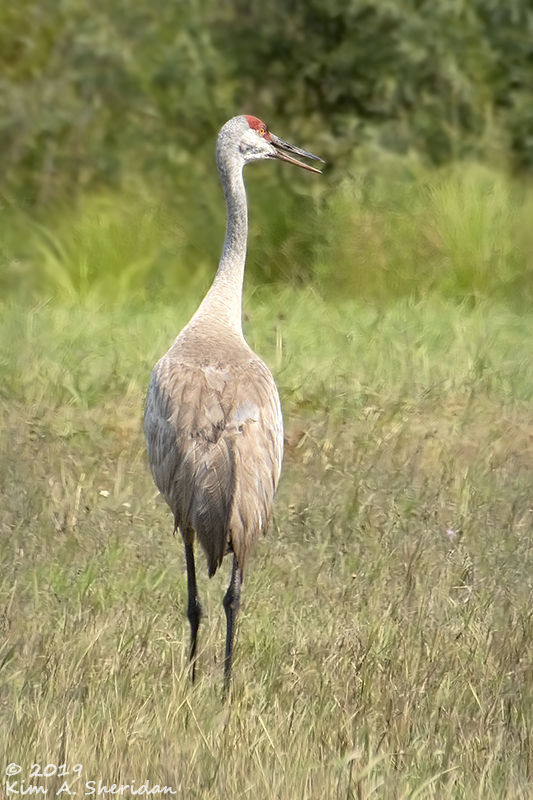 Cranes also eat snails, frogs, lizards and snakes, berries and seeds and even small rodents. 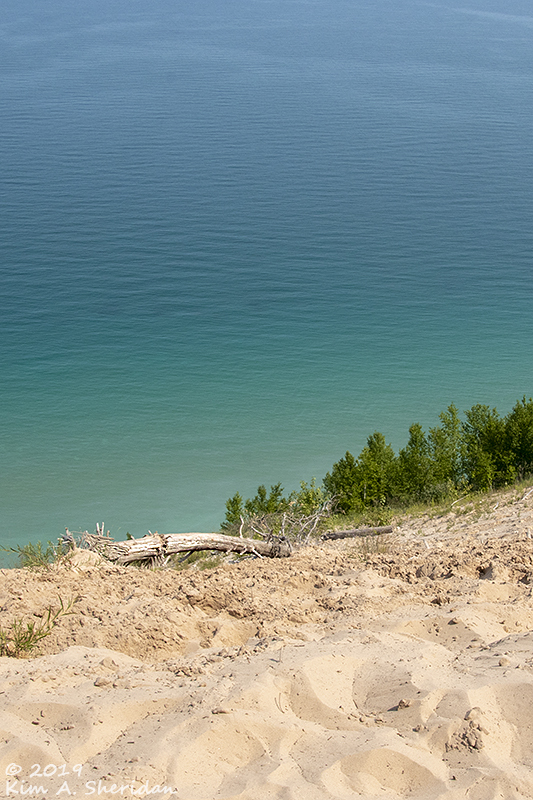 Meadows, woods, Lake Michigan and barns – who could ask for a better day at Sleeping Bear Dunes National Lakeshore? And Sandhill Cranes! The Sandhill Cranes were the perfect Michigan cherry on top of my wonderful Sleeping Bear Sundae. 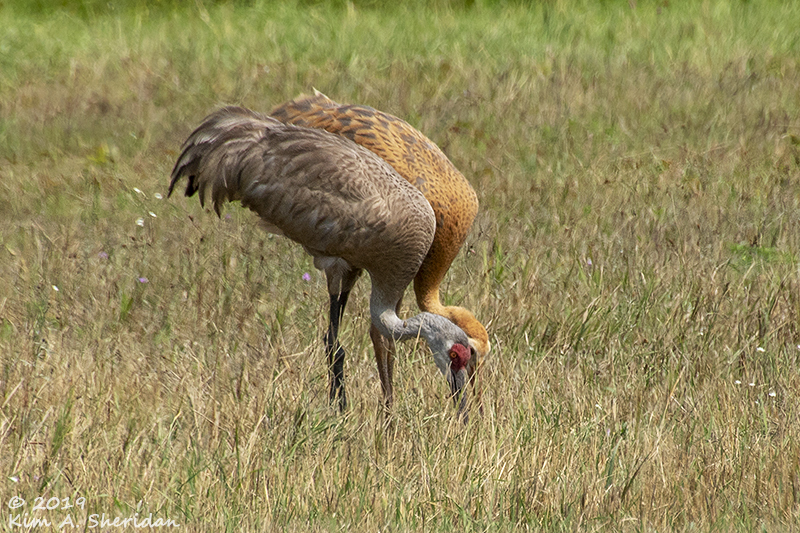 This entry was posted in Michigan, Nature and tagged Birds, Michigan, Nature, Pyramid Point, Sandhill Cranes, Sleeping Bear Dunes National Lakeshore by Kim. Bookmark the permalink.